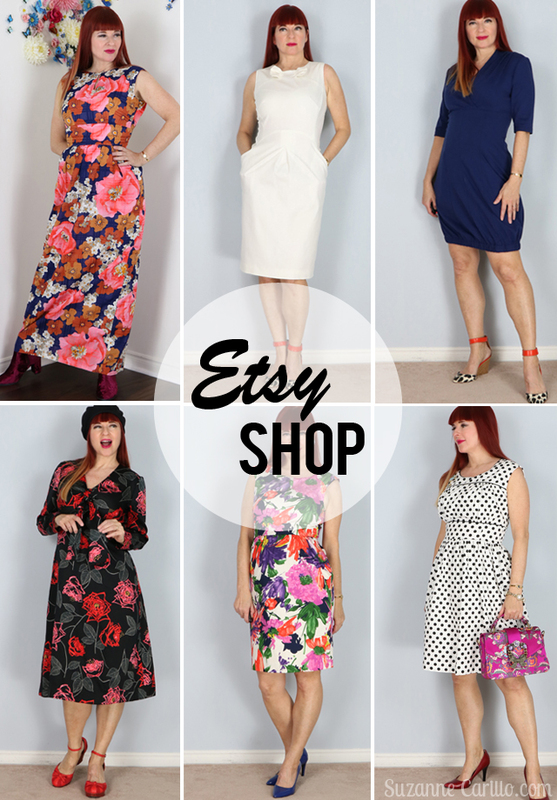 New In My Etsy Shop This Month – Get Your Vintage On! I haven’t been posting many of the new items available in my Etsy store on my blog because often it is just too hard to keep up. I try to post the items right after I list them on my Instagram if you are interested in getting first dibs. You need to be quick though. I hate it when people are disappointed when the piece is snatched up just moments beforehand. Last week I decided to have some fun modelling some of the great dresses I have for sale right now. This is very dangerous as sometimes my temptation to keep a piece becomes greater than my desire to share my love of vintage with the world. So here is just a taste of the near two hundred and thirty dresses I have for sale right now in my store. You can see them all at Vintage By Suzanne. Do you think I chose to keep any of these pieces? If so…which one? Which one would you keep? Wow, these look so good on you. Of course you pick great pieces. I would never be able to have these clothes in my house and then part with them. The second dress and the jumpsuit are my favorites. It’s not always easy parting with wonderful pieces. I agree with the 70’s chevron stripe. Isn’t it funny that I found two dresses exactly the same in different colours? That Piazza Sempione is so soft and comfortable. It is chic beyond words. Wow… great choices. The 1980s ruffle neck dress (sigh) is my choice. I forgot that the 80s actually did have some good clothes. Hey, I looked my best then! You rock every single piece. As Ally said, they all look so good I don’t know how you ever let any go! I suppose my favorites are the Piazza Sempione and the JCrew. There’s something about how they look on you that feels very old-world Hollywood. Very glamorous. That style does suit my body type. I shy away from them more in real life because they look best with pumps. My feet can only handle pumps for so long. My favourite (on you) is the navy chevron stripe midi dress, it looks so good with the red shoes. Wow, so many great pieces Susanne! You need to keep these ones as they are so fabulous on you, the color and styles..
2. The pink green and purple floral sheath. another fab dress on you. I guess you see where I am going with my love of florals..
really I want to know how you put items in your store when they look great on you and you are tempted to keep? Ah.. the top wiggle dress is perfect. I would keep that one. The Canadian Designer Bubble Dress is great. I love it, but I would put leggings or a skinny underneath it (would be too short for me, but I love the shape, the colour and the sleeves). Those shoes you are wearing with it: sooo good. And last but certainly not least the black jumpsuit: awesome. I adore it. Like Greetje, I’m in love with the Canadian designer bubble dress. I think it looks really smashing on you Suzanne and I’m guessing you don’t have another like it in your closet…? You look absolutely perfect in ALL of the sheath style dresses (long or short). I’m wondering if this style is one that looks good on most women! Weirdly I’m not keen on the way the chevron dress looks on you. I’m not a fan of that type of sleeve so that may be why. Admittedly, it’s a very creatively architectural design. This post makes me wish I could fit into more if your vintage fashions. You have amazing test my dear! Yes, I just replied to Greetje in agreement, but you too, the bubble dress. Love the colors in the top dress – but honestly, they’re all fabulous! I don’t know how you decide which ones to sell! Did you ever disclose your choice??? Yes : ) It was the chevron stripe in blue that you didn’t really like.